This blogging idea is about PAIN. Everyone gets it, even babies, but how do you explain it to others especially your family and do you think they understand or even believe you? Do you find this image true? Have you ever felt this from a loved one? Did you verify the feeling with them? 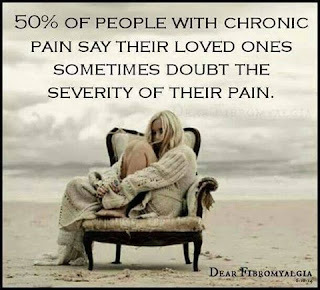 Many of us with fibromyalgia get looks of doubt or doubting comments from family and friends about our levels of pain. Some doctors even still question whether fibro pain is real! I think this is because they don't yet fully understand what causes fibro pain and what makes it continue and not go away. After all most people will just take a painkiller and their pain will go away and not come back so this is their expectation with pain. How do you convey your pain to others? Do you even think it is important to tell those around you or do you keep it to yourself? I hope you get some ideas here for creating a post around pain. Great idea thanks, I'm working on it now. P.J. With my superpower to Empizize, a mere touch and they mommentarily experience life as myself, pain, paralysis, or that of another if I touch the target person and the sufferer as a linking empizatic medium. I believe as our pain continues, becoming chronic and not acute, our loved ones get it less and less. They tire of the disease that is invisible. This is why it is so important to find your tribe. I have decided what boundaries needed to be placed as more and more of my inner circle crumbled. It is a grief of loss that comes as an an unexpected result of living with chronic pain.